What is a Post Repair Inspection? Among its many offerings, Coker's Body Shop, Inc. performs inspections of vehicles which have sustained damage and undergone corrective repairs. In many cases repairs do not properly and/or thoroughly restore a damaged vehicle to its former state in safety, function, performance or appearance or to the best of human ability. When this occurs, the damaged and repaired vehicle not only loses additional and avoidable value, it may leave the occupants and others on the roadway in an unsafe and potentially dangerous position. Poorly performed repairs and overlooked and remaining damages may cause issues as simple as uneven wear on tires to dangerous handling issues and excessive wear-and-tear on suspension and other mechanical related components. Poorly diagnosed and under-repaired vehicles may prevent the vehicle from reacting as originally engineered and intended by the manufacturer whereas energy absorbing panels fail to collapse and/or direct impact energies as designed. 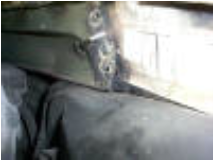 These failures may cause problems with deployment of air bags and restraint systems and be cause for significant injuries, or worse, to the driver and their passengers. Additionally, fraud plays a significant role in the quality and thoroughness of repairs. Unfortunately there are those that will forfeit the wellness of the consumer for personal and/or corporate greed. Would it be wise to assume that the repair facility and/or the insurance company beat the odds on your vehicle’s repair? Don't gamble with the safety of you and your family. Know if your vehicle has remaining damage and/or was properly and thoroughly repaired. Don’t become a victim of negligence and fraud; have your repaired vehicle inspected by an expert who works for you! Please contact us if you have any concerns or questions about your previously repaired car.